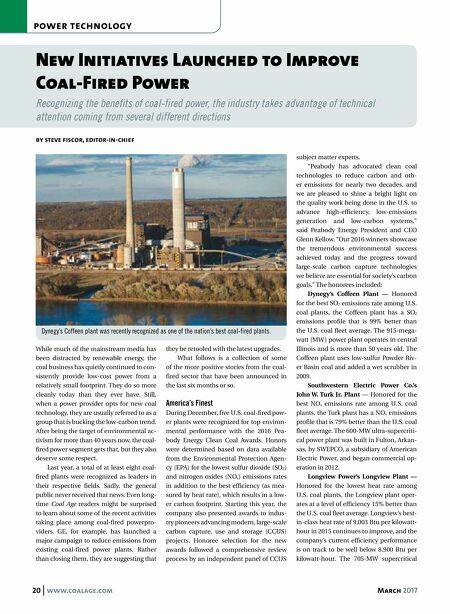 20 www.coalage.com March 2017 power technology New Initiatives Launched to Improve Coal-Fired Power Recognizing the benefits of coal-fired power, the industry takes advantage of technical attention coming from several different directions by steve fiscor, editor-in-chief While much of the mainstream media has been distracted by renewable energy, the coal business has quietly continued to con- sistently provide low-cost power from a relatively small footprint. They do so more cleanly today than they ever have. Still, when a power provider opts for new coal technology, they are usually referred to as a group that is bucking the low-carbon trend. After being the target of environmental ac- tivism for more than 40 years now, the coal- fired power segment gets that, but they also deserve some respect. Last year, a total of at least eight coal- fired plants were recognized as leaders in their respective fields. Sadly, the general public never received that news. Even long- time Coal Age readers might be surprised to learn about some of the recent activities taking place among coal-fired powerpro- viders. GE, for example, has launched a major campaign to reduce emissions from existing coal-fired power plants. Rather than closing them, they are suggesting that they be retooled with the latest upgrades. What follows is a collection of some of the more positive stories from the coal- fired sector that have been announced in the last six months or so. America's Finest During December, five U.S. coal-fired pow- er plants were recognized for top environ- mental performance with the 2016 Pea- body Energy Clean Coal Awards. Honors were determined based on data available from the Environmental Protection Agen- cy (EPA) for the lowest sulfur dioxide (SO 2 ) and nitrogen oxides (NO x ) emissions rates in addition to the best efficiency (as mea- sured by heat rate), which results in a low- er carbon footprint. 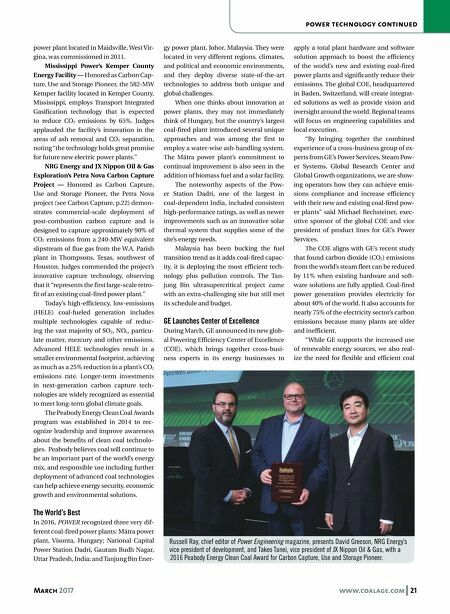 Starting this year, the company also presented awards to indus- try pioneers advancing modern, large-scale carbon capture, use and storage (CCUS) projects. Honoree selection for the new awards followed a comprehensive review process by an independent panel of CCUS subject matter experts. "Peabody has advocated clean coal technologies to reduce carbon and oth- er emissions for nearly two decades, and we are pleased to shine a bright light on the quality work being done in the U.S. to advance high-efficiency, low-emissions generation and low-carbon systems," said Peabody Energy President and CEO Glenn Kellow. "Our 2016 winners showcase the tremendous environmental success achieved today and the progress toward large-scale carbon capture technologies we believe are essential for society's carbon goals." The honorees included: Dynegy's Coffeen Plant — Honored for the best SO 2 emissions rate among U.S. coal plants, the Coffeen plant has a SO 2 emissions profile that is 99% better than the U.S. coal fleet average. The 915-mega- watt (MW ) power plant operates in central Illinois and is more than 50 years old. The Coffeen plant uses low-sulfur Powder Riv- er Basin coal and added a wet scrubber in 2009. Southwestern Electric Power Co.'s John W. Turk Jr. Plant — Honored for the best NO x emissions rate among U.S. coal plants, the Turk plant has a NO x emissions profile that is 79% better than the U.S. coal fleet average. The 600-MW ultra-supercriti- cal power plant was built in Fulton, Arkan- sas, by SWEPCO, a subsidiary of American Electric Power, and began commercial op- eration in 2012. Longview Power's Longview Plant — Honored for the lowest heat rate among U.S. coal plants, the Longview plant oper- ates at a level of efficiency 15% better than the U.S. coal fleet average. Longview's best- in-class heat rate of 9,003 Btu per kilowatt- hour in 2015 continues to improve, and the company's current efficiency performance is on track to be well below 8,900 Btu per kilowatt-hour. The 705-MW supercritical Dynegy's Coffeen plant was recently recognized as one of the nation's best coal-fired plants.